What is Infotainment System for developers? Is it a customer need? Think again. What is Infotainment System for developers? "Sounds like automakers have found a brand new customer need in the infotainment system." "The infotainment system is a new trend, we did not have it fifteen years ago with my old car. It is a new customer need, made possible with new technology..."
We want to emphasize again an important QFD point: The infotainment system is a solution, not a customer need. For those who still use the terms "whats" and "hows" to define the rows and columns of the House of Quality matrix, please note that a better terminology would be "whys" and "whats" indicating "why the customer wants it" and "what the product must be or do." "Reaching an apogee of confusion, car dashboards have become a bewildering array of screens, buttons and knobs to control functions like the radio, ventilation, advanced safety systems and Internet services... Looking to simplify such cockpitlike controls, automakers are starting to take design cues from a familiar household device, the tablet computer.... But moves that may be convenient for a tablet user lying on a couch can be deadly for drivers." In other words, if companies understand "true" customer needs and priorities, instead of chasing technology, they can actually increase customer satisfaction, innovation, and competitiveness with QFD. The Modern QFD's front-end Voice of Customer (VOC) analysis tool set has been optimized for this task. For anyone involved with any types of developments (New Product Development, Design, Quality, DFSS/DFLS, Market Research, R&D, etc. ), one of the critical tasks is to determine if a Voice of Customer statement is a true customer need or not. If it is not, the VOC must be translated into a customer need before the QFD study can continue. Let's take a quiz. Which of the following statements from Quain's article are true customer needs and which are product-related that must be translated into a customer need? Uses a touch screen instead of menus. Has an interface that consumers are accustomed to. Volume knob instead of touch slider. All interactions take place in less than two seconds. Simple controls that people can adapt to at their own pace. If you've taken the QFD Green Belt® course, you should be able to pick out the true customer needs, and translate the others into the customer needs. Failing to translate Voice of Customer into true customer needs puts unnecessary blinders on your product development team. You arrive too early that the interface must be like a tablet, must have app-like controls, must have a high-resolution display, etc. You won't see that app-like controls don't work well when the tablet is 24 inches away from your face, vibrating, and in direct sunlight. In other words, before selecting the technology and solution, you must understand the operating environment and the tasks the user must be able to perform. The most successful QFD applications are those that open technical possibilities and not lock them down too early in the study. 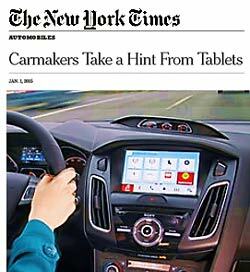 Mimicking tablets in cars may not be the best solution since those interfaces were designed for other purposes — information searching, text communication, visual display, gesturing, and other modes that are not compatible with operating a motor vehicle. © 2015 Glenn Mazur / QFD Institute. Is it advantageous to be first or to be better? Can ordinal scale numbers kill you? Does your QFD too long?